Looking for Long Long Time Ago 2 Review? Click here! 🙂 Enjoy! LONG LONG TIME AGO tells a story from 1965 to early 1970s, following the protagonist of the story, Zhao Di (plays by Aileen Tan), and her family as they journey through the years from Kampong to HDB, which parallels with Singapore’s early growth as a nation. With Zhao Di’s indomitable spirit, and with the help of her family, they went through adversities, witnessed the changes through the years, and accompanied every step of the nation’s growth in its early years. Once again, I watched this movie without watching its trailer and I had to say I am pleasantly surprised and touched by the effort put into a what-seems-to-be simple and straightforward story. Similar to the 1965 movie, the film depicts the social unrest after Singapore’s independence but in a very different way. The two most commendable points was the use of dialects in the film and stop motion effects. I was impressed (thanks MDA!) by how each characters used their mother tongue and dialect with minimal English throughout the film and Mandarin was used only as a form of narrative in the movie. I might not be a Hokkien, nor do I understand Malay, but the authenticity of the characters successfully touched my heart. Not forgetting to inject some light-heartedness into the film, Jack Neo made use of stop motion effects to exaggerate the fights, giving a hint of how people from the past tend to magnify certain issues due to the lack of education. Ah Kun (Mark Lee) is the best example of a sexist and unrefined alpha male. It was enjoyable yet infuriating at the same time to watch Ah Kun, the egoistic and arrogant character live and lie through his way while blaming everyone else for his troubles. His unappreciative nature, especially when he criticised about the government’s policies and questioned PM Lee’s actions like many locals, brought tears to my eyes. I was glad when Osman (Suhaimi Yusof) appears on screen because he balanced the negativity Zhao Di’s family was emitting. The kampung spirit and friendliness between him and Zhao Di was so heart-warming that you will miss (or find it missing) in the current Singapore. I had to admit that I am not used to watching Aileen Tan act as a suffering and pitiful lady, but definitely glad that she’s deviating from her usual Channel 8 loud and bitchy roles. While the veteran actress display the perseverance and forgiving heroine-nature audience love, I was most impressed with the performance of Ryan Lian Yong Yi as the local gangster, Ah Long. Gangster and fights are a norm for period films/ dramas like this, but Ah Long is an antagonist who has his human side – which reminded me of veteran actor Tay Ping Hui’s character Liu Mei in 1999’s Stepping Out (出路). I found it endearing to see their relationship turn from intimidation to provocation to gratitude. The little sneak preview of the Part 2 out in March 2016 about Ah Long is perhaps one of the reason I am looking forward to the second installment! Newbie Benjamin Tan’s performance as Ah Xi was a little raw initially but improved as the story continues. I wouldn’t say this movie is perfect. The use of CGI for the flood was impressive but the little “fight” (watch the movie to find out!) was a tad over the top! While the movie is not the best representative of the historic events, it is emotionally gripping enough to get you to buy the tickets for Part II! This movie was viewed in Golden Village Suntec City with Auro 11.1 by Barco, an 3D immersive sound technology. Being the first cinema in Singapore to deploy this new immersive technology, Auro 11.1 by Barco provides a much better spread of sound in the vertical axis which delivers a natural representation of 3D sound all around the listener using fewer channels than other immersive sound systems. Special thanks to Hong Peng (Hpility) and Touch PR for the invitation. To recreate Singapore floods of 1969 on film, director Jack Neo built a 30m by 30m large pool that is 1.5m deep, ‘coloured’ the $10,000 imported fresh water to make it look murky and dirty, and scattered twigs and leaves in it for authenticity. The actors shot for more than 10 hours each night, for four days in the waters. Suhaimi Yusof who plays Osman, had to jumped off the boat 24 times in one night just to create that perfect shot. The vegetable plot in front of Zhao Di’s house were planted and watered by the Art Department Crew at least a month before the shoot took place. The casts from Ah Boys To Men – Wang Weiliang, Tosh, Jasper Lai, Joshua Tan and Justin Dominic Mission cameoed in this movie. Jack Neo and his wife had a cameo in the movie as the adopters of Zhao Di’s twin daughter. Check out Long Long Time Ago (我们的故事) Facebook Page! 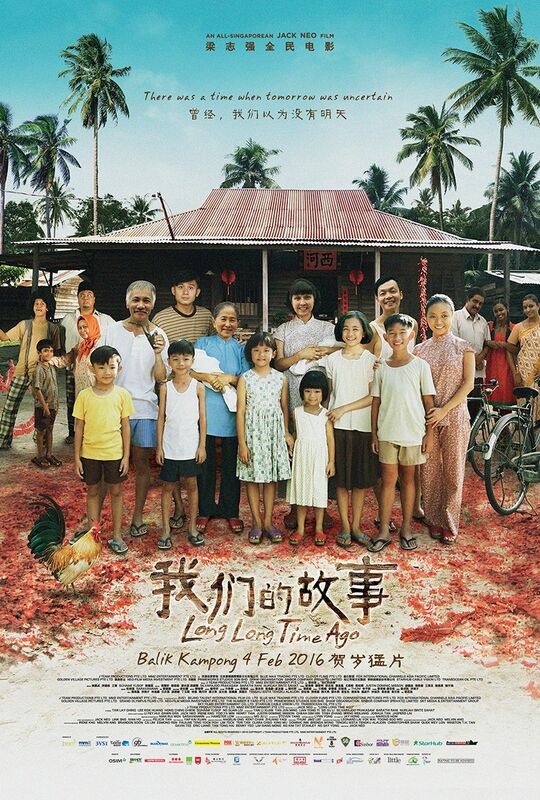 Long Long Time Ago (我们的故事) is out in cinemas on 4 February 2016. I’m imagining how hard it is to make the clean water to look that dirty and the passion of the crew to make the setting realistic by planting plants themselves and taking care of it before the shoot happens. This movie sounds like both fun and important. Forgive me if I’m wrong about the former. Thanks for the review. Although this movie isn’t available here, your review is highly appreciated! This is a good movie. You get to appreciate the heritage of SIngapore and enjoy the story too. I’m a fan of period movies and comedy films, but never watched period comedy!!! Sounds interesting! I am a movie addicted person and love to watch movies whenever I have time.Thanks a lot for this awesome review,this seems like a great movie. I hope to see this one with English subtitles, but it may not come to our country except maybe via a film festival. Your review is very enticing, even if the poster is not. It seems like a beautiful movie showing the journey of SIngapore from that Kampong time to world class HDB time. This is an interesting movie. I would love to watch this. But I guess this is not available here in our local Cinemas. wow at 4/5 rating, another movie to add to my pending list of “to watch” movies lol. Shall take this CNY break to clear up my backlogs so i can enjoy this movie. I’m also using the CNY break to clear my backlogs! I am going to watch this movie next week. Hope its going to be a memorable one that reflects the era. Singapore right now is close to my heart. I’d love to see this film and learn more about Singapore’s history. I don’t think it will be shown here in my country but I hope that it will be shown in the future in Red by HBO. I am impressed with the flood scene and how it was staged – quite a lot of work but it’ll definitely work well for the film. This movie is something that will take us back to the times when Singapore was just starting off. How were those people that time, how was that Kampong era would be very interesting to watch onscreen. Especially because we were not part of that history. already arranged to watch this with my girlies after cny! watched the trailer/ad and it looks good! Great review. Watching the trailer makes me reminisce my time back in the Philippines. Looks like an interesting movie. I’m always intrigued with movies from other countries. Oh wow this movie is clearly well-made. You’re right! I also like that they use dialect as form of language in the film because this will make them more believable. People who had survived through that old era will be able to relate more as well. It sounds like a superb film, I love films that trace back to a nation’s roots and also focus on the people during that time. They put so much hard work on this, it would be a crime to miss it! As I watch the trailer, it let me go back to an old Philippine scenario. The dress, the houses, the jobs people do in the movie, the scene, etc..it looks like my country. A bit nostalgia, so love it! I really am always intrigued by the movies of other country specially if they are portraying a certain culture of a place. I am going to add this to my movie list to watch on summer. A touching movie that singaporeans can truly relate. I dont like flood, or any film about flood nor watching a live news about it. It’s an interesting movie but it won’t be shown here in the Philippines. 🙁 It’s good to watch those that give you a glimpse of history and of the olden days.